he world is one. The death of distance on our dynamically changing planet impacts the intricate interplay between people, between people and animals, and between all living creatures and the environment we inhabit. The news headlines have multiplied in recent years: West Nile virus is found in dead birds in New York City, and human deaths soon follow. Cows in Great Britain are given tainted feed and some of the people who ultimately consume them develop a fatal disease. Large numbers of people routinely travel from one side of the world to the other, from tropical areas to snow-bound cultures, and they arrive in hours, often carrying illnesses never seen before in the new locales. Millions of people and animals are displaced by civil war, economic imperatives, and natural disasters, and issues of nutrition, vaccination, and acute treatment arise. The rapidity of change, the speed of our world, dictates a need for a new breed of medical professionals; they must be trained in health care beyond the personal level. Their work lies in the greater sphere, where decisions and research impact the future history of mankind. And one University university is already preparing medical students, not for the future, but for the now, with a singular focus on the study of public health…St. George’s University. Few centers of education can match the unique preparation offered to medical and veterinary medical students at St. George’s University in Grenada. Founded as an independent medical school almost 30 thirty years ago, St. George’s grew to add dynamic new programs in veterinary medicine, public health, research, and arts and sciences. 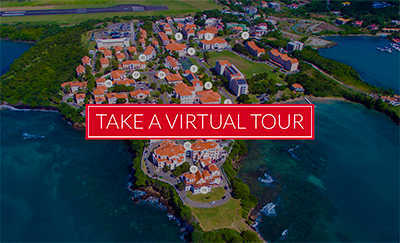 Students and faculty travel to Grenada from across the world, shaping their academic environment with a unique perspective created by true internationalism. Its Schools of Medicine and Veterinary Medicine are closely allied, and participate in joint scientific projects with the nearby Windward Islands Research and Education Foundation (WINDREF) and other such institutions across the world, positioning St. George’s at an enviable crossroads in the study of public health. The University’s medical and veterinary students work on cross-disciplinary teams, tackling complicated scenarios with a distinctly broad scientific approach. The mission of St. George’s public health program is to improve the health, quality of life, and well-being of populations, communities, and persons through education, research, and services in public health and preventive medicine. The University provides training in epidemiology, biostatistics, environmental health, health policy/management, and behavioral/social sciences, with electives such as maternal and child health, chronic disease, emerging infectious diseases, and occupational health. The University’s students have completed public health practica across the Caribbean (Bahamas, Barbados, Dominica, Dominican Republic, Grenada, Guyana, Jamaica, St. Lucia, St. Vincent and the Grenadines, Tortolla, British Virgin Islands, Trinidad), across the United States (Alabama, California, Colorado, Connecticut, Florida, Georgia, Louisiana, Maryland, Massachusetts, Missouri, Nevada, New Jersey, New Mexico, New York, North Carolina, North Dakota, Ohio, Oklahoma, Oregon, Pennsylvania, South Carolina, Tennessee, Texas, Vermont, Washington, Washington, DC), and in countries that include Canada, Botswana, Cambodia, India, Japan, Kenya, Morocco, Pakistan, Switzerland, Tanzania, Uganda, United Kingdom, and Zimbabwe. Brian Butler, DVM, a recent St. George’s veterinary graduate, traveled to Africa for his Master of Public Health practicum in 2003, to study disorders that cross between animals and humans, known scientifically as zoonotic diseases. Under the auspices of WINDREF, Dr. Butler conducted a ten-week week project on Cystic echinococcosis in the Bsongoro people of Western Uganda. The disease is transmitted from dogs and perhaps wild carnivores to humans and domestic livestock., but its prevalence had never before been investigated in the Bsongoro people until Dr. Butler began his work, following a local wildlife veterinarian who tagged and tracked lions and hyenas. As a result, Dr. Butler secured funding from the U.S. National Institutes of Health to underwrite his continuing study for his PhD at the Department of Comparative Medicine at the University of California, Davis. Students in the public health program at St. George’s impact their surroundings even before they attain their degrees. Some were instrumental in helping local Grenadian communities cope with the aftermath of the devastating Hurricane Ivan. Though they had begun an epidemiological study in an outlying village in Grenada, after Hurricane Ivan swept through, the students shifted their immediate focus to provide care during the crisis. They fanned out to deliver critical medical supplies, assess emergency needs, and monitor developing health-related situations. What Does a Public Health Background Offer for a Career? Now, as the world has turned yet again, many new positions are opening in the public health field to fight the old battles and to prepare to fight new ones. Some future public health practitioners, such as a Jonas Salk or Madame Curie, may develop treatments to eradicate emerging health scourges such as HIV/AIDS. Others could migrate to career paths in government, or intergovernmental agencies like WHO or UN-FAO, working to improve the health of the overall populace by documenting ways to manage or avoid medical disorders brought on by unhealthy lifestyle choices. Still others might coordinate initiatives documenting the close ties of all creatures to the environment they live in, how pollution of water can cause terrible dysentery in those forced to drink it, how mosquitoes that breed on standing stagnant water can carry the miserable dengue virus to the people they bite, how we can work to respect the Earth and in the end benefit ourselves. Those with a drive to the veterinary medical concentration might monitor not only the animal population at large, but also the food supply chain, on the alert for disease that could transfer to human beings. And still others might man the frontline defense against agroterrorism and bioterrorism.